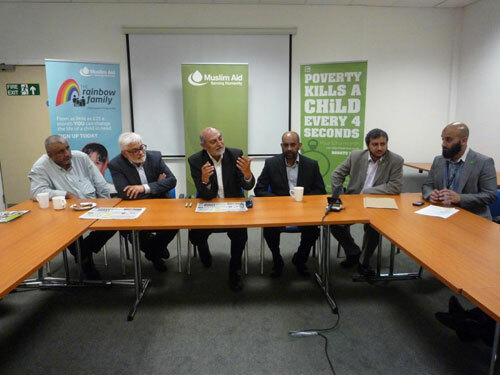 Muslim Aid signed a Memorandum of Understanding (MOU) with Balham Mosque & Tooting Islamic Centre on June 23 2011. The MoU establishes a partnership between Muslim Aid, Balham Mosque and Tooting Islamic Centre for the construction of 50 houses, a healthcare centre and a school in Nisar Khoso village in Thatta, Sindh. Balham Mosque donated £125,000 to Muslim Aid toward the project. The cheque was received by Muslim Aid’s Secretary of the Board of Trustees, Mr Tanzeem Wasti. Payment was presented by Mr Faruk Valimahomed, Chairman of Balham Mosque together with Mr Abdul Razzak Osman, Treasurer and Mr Abdul Majid, Head of Finance. The two organisations have agreed to work on an integrated village development project in Thatta, devastated during the floods of 2010. Under the MoU, Balham Mosque and Tooting Islamic Centre will continue to support the health centre and school with resources raised in the future. The development work in Thatta is part of Muslim Aid’s ongoing flood rehabilitation programme in Pakistan, where the Charity is implementing an integrated model village project in 5 districts of Pakistan, within Punjab, KPK and Sindh. The project sets an excellent example for other Mosques and community organisations in the UK to direct their donations to development projects already being supported by Muslim Aid in Pakistan. · Muslim Aid is a relief and development agency set up in the United Kingdom in 1985 to provide humanitarian assistance to disaster affected countries and to help poor and vulnerable communities overcome poverty. Over the last 25 years, Muslim Aid has expanded its work to cover over 70 countries worldwide. Muslim Aid works with all communities irrespective of faith, ethnic origin or political system. Muslim Aid programmes include emergency relief; capacity building through water, sanitation and health programmes; education and skills training; micro-financing and income generation and orphan care. As well as giving practical assistance, Muslim Aid tackles poverty by developing sustainable solutions, advocating for a more just and sustainable future.